I t’s beginning to look a lot like Christmas. Well, not quite yet, but, it is right around the corner. 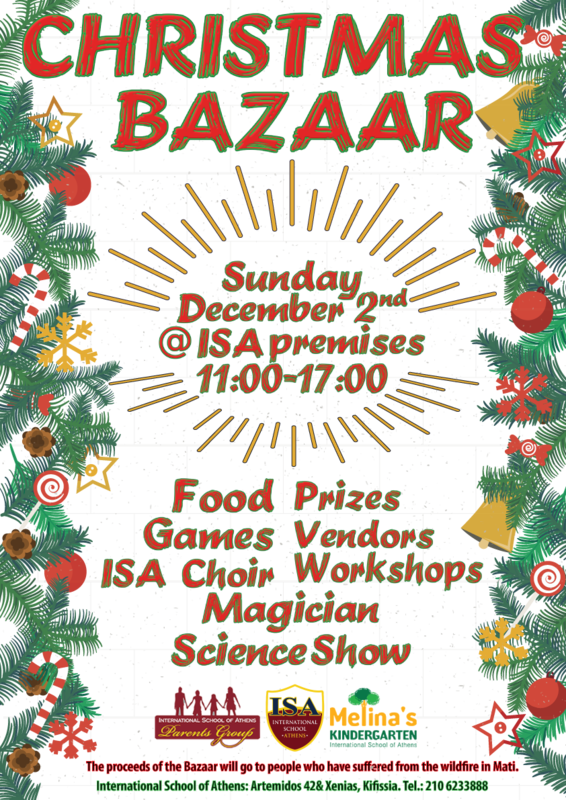 The Christmas Bazaar will take place Sunday, December 2. We want to make this a great event for our students and ISA families. As you can imagine, there is a lot of work that goes into the planning and execution of these big events. And, we cannot do it without volunteers. As you can see there are numerous roles we need to fill. Pick one, or several. Any help is greatly valued and appreciated. Many of these volunteer positions will not require attending any PGA meetings. As the weather gets nicer each day, the PGA invites you to join us for the next ISA Bonding Trip at Lake Heraion Loutraki. for a great seafood lunch, and then relax on the beach and enjoy the sun and great conversation. Of course, we can’t forget about the mothers that day (we will have a little something special for them). Meeting point: at Linto Restaurant for Lunch. the beach at 17:00 and be back in Kifissia around 18:30. The cost of the bus is €8 per person. Car Drivers: Here is a link to the Lake Heraion Loutraki on Google Maps. If you would like to join the Bus at the Archeological Site, please follow the signs from the beach. or near, the water. ISA, the PGA, and the supervisors are not responsible for accidents. Reservations until Monday, 7th May. Payment must be received by Tuesday, 8th May. All payments must include the signed payment form. After the two successful Family Bonding trips that took place last year, the ISA’s PGA (Parents Group Association) is organizing a tour and is inviting you to join the 3rd “Family Bonding trip” in the Archaeological Museum of Thebes on Sunday, March 11th 2018 (11:30 am). 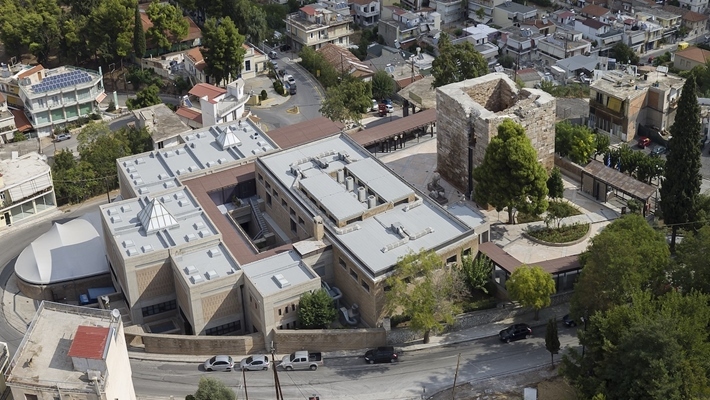 The new Archaeological Museum of Thebes occupies an exhibition area of 1.000 m2 and houses a multitude of artefacts, representing millennia of continuous human activity in Boeotia. The exhibition halls spread over two different levels, a choice dictated by the necessity to maintain the natural formation on the western slopes of the Kadmeia hill. The exhibition is arranged in a total of eighteen sections, eleven of which follow a basic chronological order from the Paleolithic period down to the end of the Ottoman rule (nrs. 3 -14 ); in this way, they illustrate over time culture, everyday life, political and social evolution in Boeotia. Meeting point: at the entrance of the Archaeological Museum. Transportation: - you can come with your own car or - use the bus that has been reserved. The bus will leave from the ISA main building at 10:00 on Sunday morning. It will leave the area of Thebes at 17:00 and be back in Kifissia at around 18:30. The cost of the bus is €8 per person. After the guided tour we will visit a local taverna for lunch. Please let us know if you would like to join us. (Lunch cost will be covered by each family separately). Reservations until Monday, 5th March. After your registration you will receive a confirmation email with the payment slip attached. Please send your payment slip and the money in a sealed envelope. You can either give it to the secretary of each building or bring it to one of our regular Wednesday morning meetings at ISA building. We would like to welcome you to ISA for the academic year 2016-2017 and would like to invite you to the ISA Parents` Group Association (PGA). On Orientation Day you will have the opportunity to become a member or to renew your membership. To encourage parent involvement in our school. To plan and organize activities and events to express the spirit of our school community. To support collaboration between home and school. To support and speak on behalf of students and their families to our school administration regarding various practical and educational issues. To fundraise and support the school as well as various charities of the school`s community. Throughout the year we organize different events where parents, students, teachers and administrative personnel have the opportunity to spend time together, have fun and enjoy the spirit of the school. Meanwhile, we plan for several actions and raise money for various charities. At the same time, we schedule regular meetings where we discuss different issues in order to support our school in the best possible way!! Last year we supported the refugees by collecting a quite impressive amount of non-perishable goods, we supported the "Orama Elpidas" Association: Volunteer Bone Marrow Donor and we offered the New Year’s Pie (traditional Greek custom) to all the children of ISA. Furthermore, the PGA supported our school by buying eight cordless microphones for Mr. Burk’s Drama Class Shows and a new fridge for the Primary School. Additionally a donation of 300 euros was offered to the Social Services of the Municipality of Kifissia. The participation of the parents in the PGA is extremely important. Through your help and support we can improve our services and reinforce the bonding among all members of the school. We invite you to become members by filling in the form that will be available to all parents during the orientation days. The membership fee is 10 euros per guardian. Once you join, you will be directly informed about all actions of the PGA and you will be more than welcome to actively participate in our meetings and events. On Friday, 2nd of September from 10:00am to 14:00 and on Monday, 5th of September from 15:00 to 17:00 a "Used Books and Second Hand Uniform Sale" will be held at the ISA main campus. If you wish to sell any used books or uniforms please bring them in marked, with your name and requested price. For further information please feel free to contact us via email address: pga@isa.edu.gr. We are looking forward to meeting you and discuss with you personally any queries you may have.